I leave for Miami Beach tomorrow and I’m packing, which I’m terrible at, help in comments please, and it got me thinking. *Missed this flight, no need to be jealous* My skincare routine has always been v simple but summer sun especially at the beach is different. Take care of that selfie by packing on sunscreen. I use makeup products throughout the year that have SPF in them. I’m using 50 SPF on my face at the pool though. Don’t worry you’ll still get that glowing vacay tan. Drink more water and then drink some more! It’s easy to get dehydrated during the summer and your skin is thirsty. If you love soda, sub it out for sparkling water. You get the fizz, hydration, and they have great flavors. Just be sure it’s not soda or soda water. When you are really thirsty, feel like you can’t quench that thirst and want super-hydration, chug coconut water. 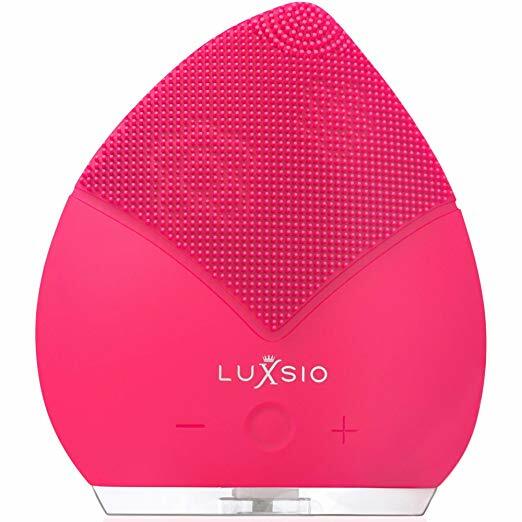 Luxsion’s Sonic Beauty Facial Cleansing Brush gently exfoliates, massages and cleanses your face in under a mintute. It has a micro-firming vibration technology that will enhance your skincare routine. The pulsations give you a smooth, youthful, just got back from vacay look. The Sonic Beauty Brush removes more dirt, oil and makeup than your typical face wash. The great part is that is diminishes appearance of enlarged pores, blackheads, blemishes and signs of aging. It’s an easy step to add to your skincare routine that I use personally. Buy one here and let me know what you think in the comments! Breathe. Because you deserve a deep breath. And because you’re beautiful just the way you are now. And it’s good for your skin. Ok bye.